Yowza. How the h ell do SAHMs with babies/toddlers blog?? Do they chloroform their tykes and hop online? Because my little ones let me type one sentence before: “MOMMY! I wants the Leapster and he won’t give me my Buzz! HELP!” Or, “I don’t want this toast, I want fun fruits!” Then after they go to bed, they’re sweet little cherubs, and I end up falling asleep with them. Sighs. I love them dearly. But I bond better part time. Some study somewhere sometime once said that being a sahm su cks and being a corporate monkey does too—the former being too much around your kids to appreciate them, the latter feeling guilty for not being there enough. 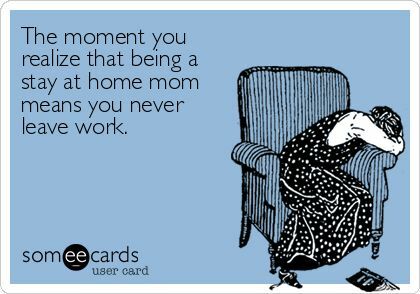 I don’t miss having to get permission from my boss for every doctor appointment, trip to the dentist, every sickness, every preschool activity, every time mommy needs to Be There. But there were days—rare though they were—when I would take a day off work and send the kids to daycare and stay home. It wasn’t often, but I COULD take a day off. As a SAHM, there simply is no day off. Never. I digressed. A little. So, that study. It says work part time, that’s the happy medium for moms. Awesome. Just where oh where is this part time job though? And who does part-time daycare? And WAHM-dom? Yeah, no. Downright hilarious, that.